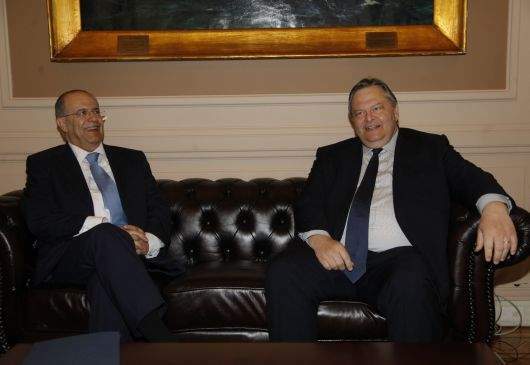 E. VENIZELOS: It was with great pleasure that I welcomed here today, to the Foreign Ministry, my dear friend and colleague Yiannakis Kasoulides, so that we could continue the substantial talks we started a few days ago in Nicosia. With his visit here today, Mr. Kasoulides demonstrates our conviction and shared will that there needs to be an ongoing, automatic mechanism for consultations between the two countries, the two governments, on the whole range of issues of foreign and European policy. So we discussed, firstly, the great national issue, ahead of the two-day meeting of the National Council in Cyprus. We also discussed European developments. On the weekend, we will both be visiting Majorca, at the invitation of our Spanish and German counterparts, to discuss the future of Europe. We talked about the upcoming Foreign Affairs Council, next Monday in Brussels, where we will be looking at all the major pending issues: what’s happening in Egypt, what’s happening in Syria, what’s happening with the Middle East peace process. And of course we discussed the promotion of our bilateral cooperation and our cooperation on the multilateral level, with other countries, particularly in the Eastern Mediterranean region, on a number of issues. What we did today we will be doing systematically, and I think that in this way we will safeguard to an even greater extent the foreign policy of both countries, also making it more effective within the European Union. I. KASOULIDES: Thank you very much. You know, whenever I come to Athens, I feel very, very different – as you can understand – from when I visit any other country. I think we understand each other on the issue of the great need for Cyprus to be in ongoing consultation with Athens, so that we can exchange views, compare notes, to consult with one another, as my friend the Deputy Prime Minister and Foreign Minister of Greece, Mr. Venizelos, said. For that reason we will reset the level of these consultations at the level of frequency and importance they had during Cyprus’s efforts to join the European Union, which, thanks to Greece’s support, became a reality. From such a level of relations, you can see that there are results, and we will promote these. Today we had the opportunity, following our meeting in Nicosia, to look at a range of issues, to which Mr. Venizelos referred. At this time, we are ready to confront all of the challenges, on all of the fronts we have discussed. I hope very soon to return here, and for Mr. Venizelos to again visit Cyprus. JOURNALIST: Good morning. A question for both ministers. A few days ago, in the U.S. Senate, the new Assistant Secretary of State for European and Eurasian Affairs, Victoria Nuland, stated that Cyprus’s natural gas is a motor force for the resolution of the Cyprus issue. I would like a comment from both of you, given your decision to cooperate closely on exchange of know-how on economic zone issues, following your previous meeting in Nicosia. I. KASOULIDES: I would take it a step further from Ms. Nuland’s statements. I consider natural gas – for the Eastern Mediterranean region, for all the countries of the Eastern Mediterranean – to be like the coal and steel that paved the way for the creation of the European Union. As Cyprus, we see this as the incentive, as an additional incentive, for us to be able to resolve our problems and differences. I hope others have the same political will. E. VENIZELOS: I would like to add to what Mr. Kasoulides said: that the study released a few days ago by the European Commission on the significance of the declaration of maritime zones in the Mediterranean turns our attention in that direction. Always within the framework of international law, always in a spirit of good neighbourly relations and cooperation, to the benefit of all the peoples of the region. JOURNALIST: What do the Greek and Cypriot side’s hope to see from the Greek government’s visit to the White House, and whether the Cyprus issue will be among the priorities of the talks. And what specific aspects of the Cyprus issue are expected to be tabled. E. VENIZELOS: It is obvious that the Cyprus issue is raised at every high-level meeting of the Greek government. This meeting will be between the Greek Prime Minister and the U.S. President. And I will take this opportunity to note – for both of us to note – that today is the anniversary of the coup, and this naturally means that we – all Hellenism – should turn our thoughts to the bitter lessons of history. Because history must guide us, so that we don’t repeat it, and, unfortunately, repetition is always a risk, as an unpleasant experience as well. I. KASOULIDES: The unity of all, the meeting of the serious challenges we have today, in both Cyprus and Greece, and, consequently, the greatest possible consensus amongst the political forces, should be taken as a point of reference so that the next generation does not suffer the pain and the repercussions of our generation’s mistakes.